DoubleDown Casino - FREE Slots, Blackjack, Roulette & Video Poker is a free video game bringing the gamer into Las Vegas experience. They can enjoy Slot Tournament that is designed especially for them. This game, developed by Double Down Interactive, works with iPhone, iPad, and iPod touch. It is also optimized for iPhone 7. Game type: gamers can play everyday with DoubleDown Casino - FREE Slots, Blackjack, Roulette & Video Poker. 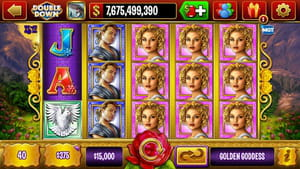 This game offers no less than 40 Slot Games with authentic games directly from the Casino floor. Apart from that, gamers can also play GAME KING Video Poker and BlackJack with daily Slot Tournaments. Guest mode: with Double Down Casino - FREE Slots, Blackjack, Roulette & Video Poker, players can play the entire game as a Guest. For this, they have to connect (create an account if necessary) on Facebook and start the game session. Scores can be shared on the social network if needed be. Enhancement: new games and new slots have been integrated to this new version of DoubleDown Casino - FREE Slots, Blackjack, Roulette & Video Poker. Concerning new game, Roulette has been added to it to let gamers hit number and color with one spin of the wheel. DoubleDown Casino - FREE Slots, Blackjack, Roulette & Video Poker can be used in several languages that are English, French, Italian, German, Portuguese and Spanish. Latest update on November 16, 2016 at 07:22 PM.